Well, one thing led to another and even though I got C's in my one writing class in college (and told God I could do anything for him but write) I got my first writing job for a TV series. And then another and then some directing jobs and finally some books. (I think I've written and/or directed a few dozen films and about 60 books). The projects have won about 40 awards, I get to travel all over the world, and I'm having the time of my life. I often think that none of this would have happened if I lived my life my way. I would have never chosen writing and directing for a living. Instead, I might be in somebody's mouth this very minute drilling away as a dentist. Don't get me wrong, there's nothing wrong with being a dentist, it's just not what I was designed for. So, everywhere I go, I encourage people to say yes to God, no matter how foolish it may feel, because by doing that, they'll be in the center of His will and living a cooler life than they'd ever dreamed possible. It's not always easy and it can be a little scary…but it's anything but boring! Today I live in California, not too far from Hollyweird (where I'm still trying to make a difference) with two cats, two kids, one dog and one wife. Another Faithword book by Bill Myers is The Voice. Thirteen-year-old Jazmin, her ex-Special Ops uncle Charlie, and former FBI agent Lisa are reunited in the second of the Voice of God series to stop a an assassin driven to murder members of a megachurch led by Lisa's brother. This assassin has drawn in a coven of teens toying with satanic practices to support his efforts. The naive youth engage in ceremonies that appear to usher in the death of each of his victims. When their rituals open a portal into the spiritual realm, a terrifying and mysterious entity crosses over to our world. The battle culminates with the capture of Lisa's father as the next target and a Black Mass requiring both their deaths as a sacrifice. The team will, once again, have to rely on all their wits, strength, and faith to survive in this action-packed, unearthly warfare. My Review: The first word that comes to mind when I think of this book is wow! This one is a page turner for sure. I tore through this book, as it is jam packed full of nail biting, edge of your seat action. It was very hard to put down. I felt like i needed to know how everything ended and I needed to know now! I really enjoyed it! 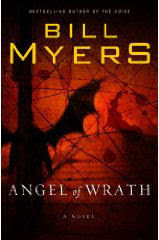 If you enjoy fast paced, action type stories, you will love Angel of Wrath. It is very suspenseful, wonderfully written, and really makes you think while you read it. I highly suggest it!